I was helping out in the Power BI Community and I came across the following requirement. The user had sales figures and based on the Previous month, they wanted to have an arrow showing if it was up or down. As well as if there was no data to say that there was no data. So this is how I achieved this below. The first thing that I did was to create a Date table and link this to my table above. This ensured that when I wanted to create my PREVIOUSMONTH DAX measure it would be simple and easy. Now in order to get the Unicode Characters I followed the very interesting blog post by Chris Webb: The DAX Unichar() Function And How To Use It In Measures For Data Visualisation, in which I learnt how to use Unicode Characters in a measure. Next I found the following website which contained the Unicode numbers for my arrows I required. The final piece was where I created the Arrows measure. Due to having multiple conditions instead of having nested IF statements I found it easier to use the SWITCH DAX function. I also know that with the SWITCH DAX function it evaluates from top to bottom. This could be changed to anything value, but I prefer it being BLANK. Next is where I use the Unicode characters in my measure. Here I compare if the Sales for the [Sales Amount] is >= the [Previous Month Sales]and if it is then use the UP Arrow. This is highlighted in BLUE. Next is where I use the Unicode characters in my measure. 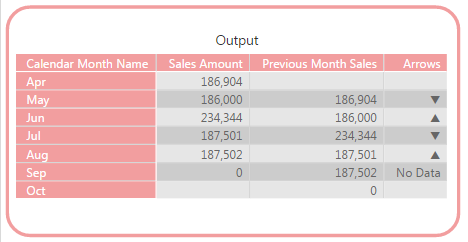 Here I compare if the Sales for the [Sales Amount] is <= the [Previous Month Sales], and if it is then use the DOWN Arrow. This is highlighted in ORANGE. Below is the outputted table, which is doing as what was required. As you can see from above being able to make sure of the Unicode Characters can make your dataset that much easier to read. Can I recommend the use of variables in your measure? For example [Sales Amount] gets run 4 times by the time it reaches the last test, and [Previous Month Sales] 3 times. Using variables will limit that to 1 execution per measure and much better performance. Thanks for the code suggestion, that does work well. It is funny because I do come from a traditional data warehousing background where previously I used variables in TSQL stored procedures all the time to simplify things. And I should start thinking along similar lines for when creating DAX measures.